Hello World. This is a highly customize-able Weather plugin for WordPress via Google and Lechlak. The largest benefit of this plugin is the amount of customization that is available. You will be able to flawlessly embed this widget into your website. A lot of the current plugins don’t give you the amount of control that really benefits the user. The point of any extension in any CMS is that the user won’t need to code anything to make it work the way they want. This is my goal. Title ( As Always ). City and Country for Forecast. List found on Wikipedia under 639-1 Column. The sub headings for days. 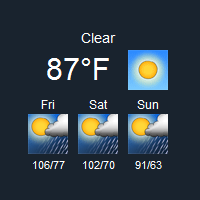 The sub text for the temperature on the sub headings. Forecast for the Next 3 Days. Center the box in the widget location. Create as many instances as you want! 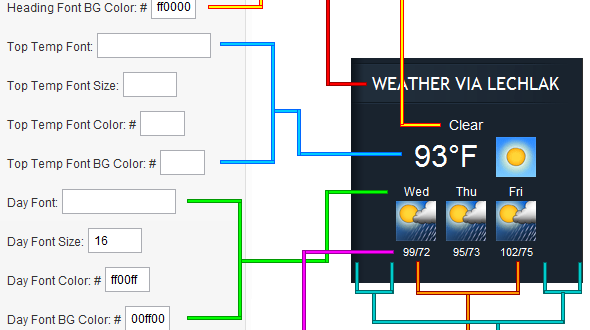 This is how the wordpress weather plugin works This breaks down each section of the code and helps illustrate the frontend of the interface to the backend. The next image looks very simple, but breaks down the four sections and simplifies the imagery. If enough people decide to show interest and purchase this plugin, there are some more features that I would like to include into this plugin. Forecast for the Next #x Days.